'The Road to Wigan Pier' is split into two parts. Part one is George Orwell's recording of his experiences in the North of England, meeting miner's families and reporting at first hand what he saw and heard. Orwell records with sincerity the working class condition. There is no blame or embellishment of what Orwell saw. Orwell's descriptions of the people in the boarding houses he was staying in, are wonderful. You really get a sense of the filth and depravation, and yet the people make you feel at home, to the point of marking your bread and butter with "a black thumb-print on it". I appreciate Orwell's candid writing. The stark reality of poverty is brought to life by Orwell, from his description of the conditions of working in the mines, to the weekly shopping bill and food consumption. Part two is Orwell's polemic on what he saw and experienced. I found this part of the book filled with passion, anger and justifications. Orwell always makes sure to explain the reasoning behind his arguements and even apologises for his background. Part two consists of political theories, language, class distinction and the personal journey Orwell experienced whilst researching part one. 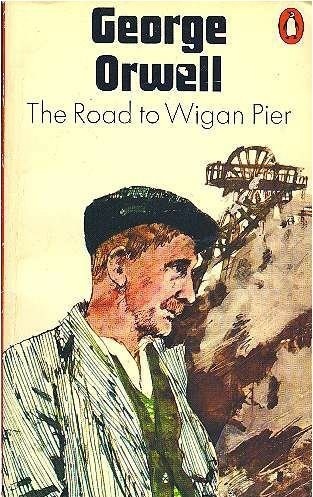 In my opinion, 'The Road to Wigan Pier' is a wonderful snapshot of a time and a place. It still has a place in literature today as a reminder to us all that there are still destitute people in the world and that things haven't changed as much as we hoped.